An ideal amalgamation of eye-catching design and exhaustive features is responsible behind the success of any eCommerce website. Customers are usually enticed with the elements such as comprehensive list of products to choose from, easy payment options and real-time customer service support. 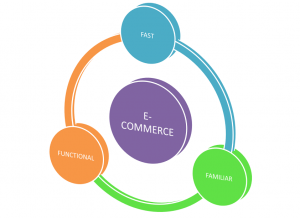 A customer-centric e commerce website imparts boost in the sales of products and also aids in the improvement of brand reputation. The awareness of the brand in the market is accelerated through the administration of engaging content in your e-commerce store, along with the development of online reputation. It evokes social media sharing and boost search engine ranking of the store. Content can be in the form of spicy news or grand launching of any product or event. Additionally, the content for the product description or services should be informative and relevant in order to persuade the customer to purchase. Organizations hire expert writers to prepare strategic content, so as to attract mass number of customers. The ever-rising fierce competition in the market has led to the elimination of static websites, with few chunks of content. Application of unique content is must for an ecommerce store to prioritize itself in search engine ranking. The finalised catchy theme should be consistent throughout the entire store. The design, pattern and colour of the theme should not be confusing to the user. The navigation system of the store should be simple and intuitive for seamless user experience. The colour combination used in the website is the life of your website, so you need to choose the colour that gives a feel of elegance. The shade of the colour should match to the colours of the products showcased in your ecommerce store. In the similar manner, the importance of colours in logos and marketing is equally remarkable. Brand revelation in the market is intensified by making use of relevant colours. Site navigation is one of the primary and critical aspects of the design structure of any ecommerce store website. It should impart high level of convenience for the users to locate the product they are searching for. Prioritize the requirement of the user to facilitate them with quick searching option. Make sure that the customers don’t feel that they are in the middle of nowhere. The structure of the website and its exquisite design are totally dependent on each other. Of course eye catching design increases the users stay time but it is meaningless if the user is not able to locate exactly what they are looking for. All this criteria should be considered at the preliminary stage of the designing process, such as the total number of WebPages and the manner in which the pages are linked to each other. The use of graphics, images, icons and info graphics should be in accordance with your business. It is extremely challenging to issue a seamless checkout process in the beginning to the user. In order to accomplish it, you need to gather and analyze the feedbacks from the users and enhance your checking process as per their requirement. Make good use of tools such as Google Analytics on such matters. Make your checkout process as simple as possible. Only ask for the information that is relevant to the product being ordered. Users easily get annoyed, if they are forced to fill up a lengthy checkout form. The final section of any checkout process, is the payment page, which should be as much simple as possible. Of Course, to build a reputation in the market, you would have endeavoured hard, to come up with an exquisite website. But it does not ensure that it is completely bug free and still there might be some issues. These issues can hamper your customer experience; hence in order to eliminate those issues you need a powerful technical support team. Your support executive should be efficient in comprehending the queries of the clients in order to resolve it within matters of seconds. Obtaining feedback from the users is essential, but above that you need to acknowledge the reports you get from the customers. There are multiple options available to collect the feedback through chat, social media or through a toll-free number. An ecommerce store with no support is the one which fails to win the trust of the users. This guest article was written by Rahim Makhani, who is the award winner CEO and founder of Auxano Global Services – a web and mobile application development company. He is keenly interested in writing technical blogs pertaining to android and iPhone application development. During his spare time, he loves to dive in the pool and enjoy playing golf with his friends.